I just found a site that could waste a whole lot of my time (thanks a lot, Sharon!). It shows how people across the United States use and pronounce words differently from one another. Living on the East Coast, I have always referred to soft drinks as soda. My friends from the Midwest, however, call it pop. Parts of the deep south refer to all soft drinks as coke. Apparently no one really calls them soft drinks. But most of us know at least something of this. But wait, there’s more! 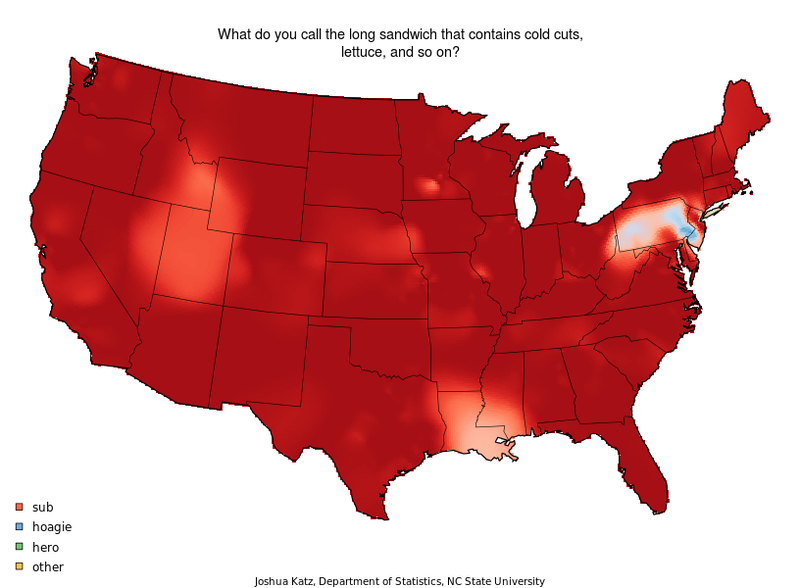 Joshua Katz, a Ph.D. student in linguistics at North Caroline State University recently published a fascinating set of maps illustrating the findings of a dialect survey by Professor Bert Vaux and Scott Golder. Almost everybody pronounces aunt identically with ant. Only around Massachusetts is aunt most often pronounced ahnt. In parts of Minnesota, North and South Dakota it’s about 50-50. People call a long sandwich with cold cuts a sub. Unless you live in Philadelphia. Only there is it a hoagie. Folks down in Louisiana call it a po-boy some, but even there, sub is still most common. In Philadelphia, New York City, and New Jersey, they pronounce syrup see-rup. Everyone else says sir-rup. The South and East Coast (except for South Jersey and Delaware) pronounce caramel with three syllables. The rest of the country prefers two. There are four different popular ways to pronounce pecan. PEE-can in New England and eastern Virginia, North and South Carolina. PEE-kahn in northern Michigan and Minnesota. Pick-AHN along much of the Mississippi, Oklahoma, and northeast Texas. Everybody else prefers pee-KAHN. Ya’ll is the preferred 2nd person plural pronoun from Virginia to Texas. Kentucky leans toward you all. On the northern border of these states, they use the technically correct you. The rest of the country, including south Florida, most often says you guys. There’s much more. I invite you to check it out. Below is a little sampling. Ya’ll please leave your comments below, hear? In WINDBER and Johnstown (southwestern PA), we called a soft drink a coke no matter what flavor. (In the 1930’s to the 70’s). Our school even had a slip of paper sent around to the classrooms before lunch asking what kind of coke you wanted for lunch, if you didn’t choose milk. (In the days before they arrested you for having snacks, like today). You would always ask for a soft drink by saying: (Gimme a grape coke or gimme an orange coke” and so forth). Also the local creeks were called “cricks”. This are is located on the top of the Alleghenies on the Appalachian ridge. Nobody’s getting arrested for having snacks, drama queen. And yes, my friends in Pittsburgh are called “yinzers” for a reason. Hello mates, its fantastic post regarding cultureand fully explained, keep it up all the time. We lived in northern Illinois many years after having moved there from Missouri. All the locals said, “yous guys” when referring to more than one person. Yes, thats you with an s… drove me nuts! I much prefer “ya’ll” or our family adopted “you guys” while we lived there. In N.C. at least in the Piedmont area, a soda is often referred to as a “drink” or “drank”. As in “if y’all are going to the store, get me a drank”. Meaning a soda pop. If you go to someone’s house, and they ask, ” can I get you a drink?” They probably mean soda or sweet tea. Just sayin”. Oh and one more thing before I go! I loved this post but I would like to say one thing. I live in Tennessee but grew up n Louisiana and nothing makes me angrier than to see people with southern accents represented in movies or television as if they are stupid! Why is it that the stupid guy who works on cars or the stupid cop etc always has a southern accent? These maps show that people, no matter where they are from, even Montana pronounce their words differently from the way they are spelled. It doesn’t mean they are stupid, it means they have character! And if you find yourself here in the south, yall are welcomed to stay! Most southerners are warm, caring people, even the rednecks! But if you can’t stand the accent, then go back to where ya came from! As my dad would say “don’t let the door hit ya where the lord split ya”! I lived in Florida for 10 years and Texas for 3 and in both places as a Western New Yorker I found nothing but complaints every time winter would come around from the supposed “hospitable Southern born” Cashiers in checkouts would whine about the snow birds and it was just everywhere. I even had a sitting Judge in a case I was involved in tell me I better behave like the perfect southern belle in his court when he heard I was from NY. I’m sorry i’m not a southern belle, I was not raised to be bare foot pregnant and in the kitchen with the girls as one kindly southern uncle told me I should be while having a beer in the yard with my husband and the boys. If the above is what a southern belle should be I feel sorry for the women of the south. I would get so tired of the same northerner go home comments I finally gave up and went home. I did not find the south hospitable at all most of the time. I live in Tennessee but was raised in Louisiana. I and everyone I know pronounces pecan more like peck – ahn……They didn’t even have that option. And so that you know, y’all is always plural! You’ins is singular! I once heard “Allsya’lls come out of my stepdaughters mouth, as she was yelling at the kids! “I am gonna come in there and beat allsya’lls butts! I about fell off my chair, I was laughing so hard! She was from Georgia! In MIchigan it was Sears Roebuck! or a Sears catalog. The soda/pop issue is one that my family cares deeply about. I’m originally from Syracuse, N.Y., a “soda” town, while my wife is from about 150 miles down the Thruway near Buffalo, a “pop” area. 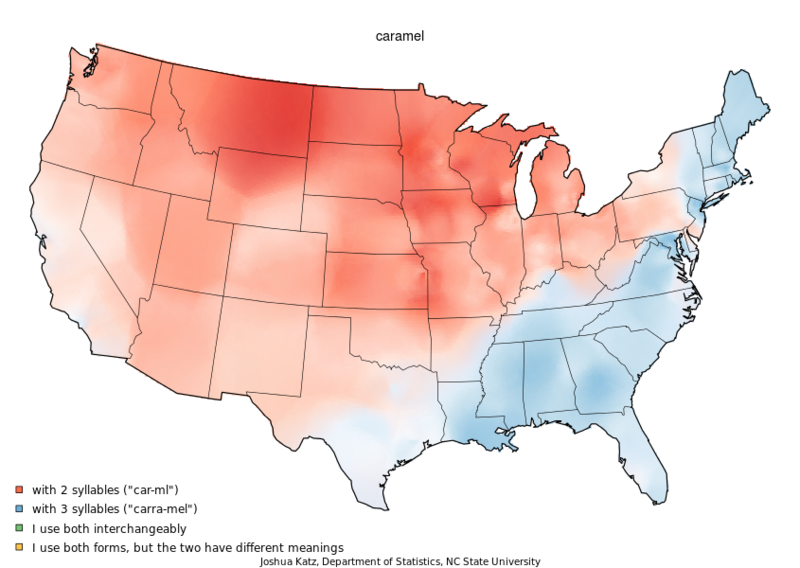 We’ve always joked about our search for that line of demarcation somewhere near Rochester where “soda” becomes “pop” and vice versa — leave it to a linguistics researcher to actually find it (somewhere around Rochester, as we suspected). While we’re on the subject, I didn’t find “wash/warsh” on the list. The use of the “warsh” pronunciation has always seemed to defy geography — I’ve mostly heard it from people out West, but also from people from New Jersey and other points east. Somebody help me if it’s on there and I’m missing it. Interesting thoughts on soda/pop. Thanks. The great Rochester divide. Interesting on wash/warsh. I grew up surrounded by people who say warsh and broke myself of saying it when I was a teenager. I always thought it was just an Ohio thing. Michigan and Indiana both say warsh, well, some do, some don’t. Myself, it drives me crazy! Do you see an “R” in wash? You forgot all the Pittsburgh slang. Hoagie is a Pittsburgh thing, and we say yinz instead of y’all. Check out Pittsburgh Dad on YouTube if you want to hear some Pittsburghese. I didn’t forget anything. I didn’t do the study. The map does include Pittsburgh in the “hoagie” area, but it’s more dense in Philly. I know lots of people from Pittsburgh and I am also surprised they didn’t include “yinz” in the data. It would have been interesting. I must be some sort of oddity (could be because I’m a military brat raised by an Australian mom), but I actually don’t say some of those any of the ways described. I say aunt the Brit way, as well as tomato, and a few other words that always get me a second look, at least here the in the good ol’ USA. 🙂 Good post! I saw this the other day and it made me laugh then too. My home state of Montana is one of the only few places that pronounces everything correctly and attaches the right nomenclature to things. Now that I’ve been transplanted to Texas, I still say “you guys” frequently, as in, “What kind of pop do you guys want?” The y’alls and the all y’alls have me fixin’ to scream right quick. I refuse to adopt a twang to my tawk. AHHHH! This comment made me chuckle. Montana pronounces everything “correctly”? “Pop” is no more correct than “soda.” And “you guys” is still a regional idiom. Standard English grammar lists “you” as the plural form. There’s nothing “correct” about “you guys.” It’s not incorrect either, of course. It’s just one way Americans say it. My husband, who is from central NY near Syracuse, swears people say “yous” there, as in, “See yous later.” It is the only weird thing he says and he says it whenever he exits somewhere. Drives me nuts. I lived in southeastern NY for 4 years and no one said yous. Do you know of this from that area of NY? Also, he and his family say country folk in that area of the country are called hillbillies. No they aren’t…that is a southern term. Up north they are rednecks. I can’t convince him otherwise. Opinion on that? I was born in NH to a MA family. I spent my first 8 years in NH and NY with regular visits to Mass. When I was 8, we moved to south central PA. It was like they were speaking a foreign language! And my classmates often looked at me like I was an alien when I spoke. The teachers thought my combination New England/New York accent was a riot. Of course I insisted I didn’t have an accent (I can only imagine how I must have sounded), they were the ones with the accent. My strongest memory of my first day of school in PA is my soon to be friend Angie asking me, “Where you’uns from?” I had NO CLUE what she was asking me. My teacher had to step in and translate for me. I lived there until I was 19 and learned about you’uns and pickled eggs and all sorts of weird Pennsylvania things. I still hate their accent to this day. Several people have commented that the survey didn’t include “you’uns” or “yinz” as is common in western PA. Maybe on the next survey! And the plural of “ya’ll” is “all ya’ll”.